What makes or breaks a garage door’s functionality isn’t the door itself- it’s the inner mechanisms that are responsible for the smooth open and close of your garage door. Our company also provides a free estimate on other materials that you’ll need aside from the panel door itself, including door weather seals, cables, rollers, hinges, springs, and openers. You can also opt to customize garage door parts so that they perform faster or more quietly- it’s just a matter of choosing the right brand and type of product. For example, we have special rollers that minimize the noise during open and close operations. You can also ask us to replace standard top-section steel parts with high-quality reinforced steel in order to reduce the effects of future wear and tear. In the future, if any of our materials break up, we can easily come up with replacement parts. You may even get the chance to enjoy warranties on some of the brands that we distribute. So, what are you waiting for? Tell us all about your garage door dreams and ideas and we’ll do our best to come up with a free estimate. In this way, you’ll be a step closer to improving the functionality and aesthetics of your home, as well as increased security for your car. Put your trust and call Ken Davidson Garage Doors, the high-quality garage doors provider. We definitely won’t let you down. San Dimas is definitely the place to be. It’s the perfect place to party, whether you’re a college student, a young professional, or a senior executive. Everything about San Dimas is glamorous, such as the people, the cars, the buildings- everything from residential to commercial establishments. People say that nothing ever seems to get old or second-hand in San Dimas. Have you ever wondered why the cars in San Dimas always seem spotless and brand-new? It’s because their owners do their best to maintain them in tip-top shape. You’d be surprised at the number of companies who offer garage door repair San Dimas. Every company has its own roster of garage door models and materials from certain brands. Every company seeks to catch the attention of the hip San Dimas elite who would spend a lot just to thoroughly fine-tune their luxury or sports cars. How do you determine which company offers the best garage door repair San Dimas? How can you discern which company promos and discounts provide the best bang for your buck?We at Ken Davidson Garage Doors outshine the competition- not only because our company name proudly bears the San Dimas stamp, but also because we can live up to our mission vision: to provide high quality garage door materials, and unparalleled customer satisfaction. We are able to accomplish this by adopting a customer-centric approach on all garage door acquisition and garage door repairs.Our dedication to refine garage door operations extends even beyond our office and branches, thanks to our team of garage door experts who can address your needs right at your very own doorstep. Is a defective garage door hampering your daily routine? Or have you been dreaming of a garage door replacement for the longest time but couldn’t do anything about it? Well, now is your chance to fulfill your dreams- all you have to do is pick up the phone and dial our number, or launch your Internet browser and check out our website. With a simple phone dial or the click of a mouse, you get the opportunity to get the best garage door not only in San Dimas, but the whole country as well Ken Davidson Garage Doors will surely exceed your expectations. Browse through our available garage door designs, or pick out specific materials for your future garage door by checking our extensive collection of garage door material brands.You’ve been browsing the Internet for hours now, trying to find a satisfactory result for your search query, “garage door repair San Dimas” You discovered just this morning that your good old garage door of ten years has stopped working completely. It won’t budge, no matter how thoroughly you clean it. You’ve wasted almost half the day trying a long list of do-it-yourself quick fixes in the hope of jump starting the errant mechanism. But it seems that you’re really down on your luck, because nothing seems to work out. As a last resort, you skim through the Internet search engine results, checking out the companies appearing on the top rankings. After some hesitation, you decide to inquire about Ken Davidson Garage Doors, a company that has been receiving a lot of positive reviews and feedback.We at Ken Davidson Garage Doors treat our new, casual clients with as much respect and enthusiasm that we bestow on our long-term clients. We have made our mark in the garage door industry not only because in terms of quality, but more importantly, in terms of customer service and satisfaction. We know that some of our clients attach not only functional, but sentimental value to their garage doors. Clients whose garage doors stop working after a decade of flawless operation are more likely to have it repaired than buy a new one altogether, especially if it was custom-made. Practical-minded clients, on the other hand, opt to acquire modern garage doors because of advances in technology and more streamlined designs.Ken Davidson Garage Doors will always be at your side, regardless whether you are sentimental or practical-minded. Whether you choose to repair your defective garage door or decide to acquire a new one, we will guide you through every step of the way. With careful planning and proper budgeting, we can help you mold the garage door you’ve always dreamed of. No longer would you have to bear the grating sounds of your old garage door, nor be late for important appointments because it opens to slowly or refuses to open at all. Just give us a call or e-mail us, and we’ll be there to repair defects or provide you with a free estimate of any garage door services you want to avail of. You won’t have to worry about any busy signal or unanswered e-mail when it comes to us. Ken Davidson Garage Doors practices a customer-centric approach.You’ve been doing some research lately because you’re interested in joining the garage door bandwagon. Several of your friends have opted for garage door installation, and you’ve envied how their garage doors seem to enhance the look and feel of their homes. While everyone keeps on blabbering about the security and maintenance benefits of garage doors, you believe that garage doors can also be used to make a garage look classy. After all, several Hollywood movies have featured garage doors. Even though they’re rarely the centerpiece of a particular scene, you’ve watched several instances wherein the foreboding hum of garage door roll up gates would signal the start of a free-for-all fight scene, or the arrival of a glitzy, high-tech car. You’re after that classy effect. You believe that even though you don’t own a sports or luxury car, as long as you keep it like one, you’ll earn the respect and admiration of your family and friends. The time is nigh to hunt for a garage door, so you consult your favorite sea.Ever wondered why our company’s name always appears on the top of the search engine list? That’s because Ken Davidson Garage Doors is the best in the garage door services field. Old and new clients alike have praised our expertise and sense of professionalism. Do you need to acquire a spanking new garage door, or are you in the market for garage door repairs? Need to consult a garage door expert for some much-needed modifications? Look no further, because Ken Davidson Garage Doors is here to cater to your every garage door need. We even provide free estimate in order to guard new clients against bill shock, as well as garage door coupons for our loyal clients who want to construct additional garage doors or modify existing ones. Do you want your new garage door to be grand, or do you want it to be a no-nonsense, solid security feature? We are able to adjust to our clients’ whims in garage door design. After all, we have the widest-ranging options for garage door materials and designs. This enables us to accomplish any garage door plan in a jiffy. Contact us today to get a taste of our much-raved, highly-respected garage door services. You can also drop by one of our branches to get a preview on how we make garage door dreams come true.You’re planning to go on a vacation. You have a major problem, however- you’re worried that your car might not survive for a week on a paid parking lot. While you have a garage door in your house, you don’t think that it provides adequate security, especially since you don’t live on the posh part of San Dimas. Plus, there’s the fact that your garage door has been acting weird lately. You would hear squeaks while the roll up gates open or close. Sometimes the garage door panel would tilt at an unnatural angle, and you’d have to kick it in order for the panel to snap back into place. Your garage door openers are unresponsive, and you’d have to click the “open” button several times before you hear the welcome hum of garage door mechanisms springing into action. You know that you have to resolve your garage door predicament so that you’ll get to enjoy your vacation with the peace of mind that your car is completely safe. You skim through classified ads, and search the Internet with “garage door repair San Dimas” as your keyword. The search results are extensive,but a certain company catches your eye- Ken Davidson Garage Doors.We at Ken Davidson Garage Doors know that car security isn’t a walk in the park. With car thieves roaming the streets and pranksters wanting to make mincemeat out of random cars, you have every reason to consider increasing your home security by means of garage door installation. We have the best garage door experts in the field, as well as materials from established brand names in the garage door market. We treat every prospective client to a free estimate of our garage door services, to show that we are sincere and dedicated in our mission to make garage doors available to anyone, anytime. Our garage door experts are also available on-call for any urgent garage door repairs. We know that a malfunctioning garage door doesn’t only present a security risk, but also poses unnecessary hassle. We’ve had clients who were forced to ditch major business deals just because they couldn’t get their car out of the garage because of a defective garage door. That’s why we’re always ready to lend you a helping hand by clearing up any problems with your garage door mechanism.You’ve been mulling on classified ads all week, trying to discern which garage door services company offers the best bang for your buck. 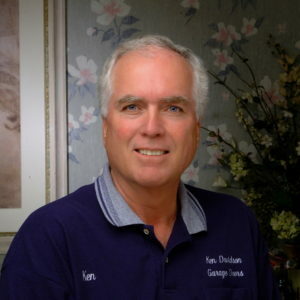 You’ve even resorted to Internet search engines, using keywords such as “garage door repair San Dimas,” “garage door repair San Dimas,”and “garage door repair San Dimas” You’ve noticed that all three keywords yield a similar result- Ken Davidson Garage Doors. Convinced that our company is highly qualified enough, you decide to give us a call- and get instantly blown away by our impressive knowledge and professionalism on garage door matters.We will be able to address all your garage door needs. We have several branches scattered across the United States. We mean business every time we give out garage door coupons or assist prospective clients by providing a free estimate on upcoming garage door acquisitions.We have the best stock of garage door materials on the market. Simply let us know whether you’re thinking of garage door installation for your home or for your business, and our garage door experts will take it from there. We specialize in both residential and commercial garage doors. Our company is also a licensed supplier of several garage door brand names. You name it, we got it- high-quality hinges, roll up gates, panels, cables, and garage door openers are ready for your perusal. We also believe that functionality and fashion can be melded- that’s why our garage door experts have preset design plans for a wide range of garage doors. Are you going to install a garage door in a townhouse, a commercial area, or a mansion? Ken Davidson Garage Doors takes the location of your home into consideration and comes up with an ideal garage door design. After all, your garage door should also contribute to the pleasing aesthetic value of your home.Get the ball rolling and embark on a new garage door adventure by contacting us via landline or visiting our home page. It’s never too late to provide maximum security and maintenance benefits for your car. You deserve utmost comfort and security inside and outside your home. With Ken Davidson Garage Doors, you won’t ever have to worry again about car thieves or weather problems- our unbeatable, high-quality garage doors will keep out the woes of the outside world, and keep your car at peace within the confines of your home.Are you worried that your neighborhood in the San Dimas is an unsafe environment for your car? Are you getting psyched out by the hungry stares of passer-byes whenever you drive by in your brand new car, or the untrustworthy demeanor of security guards in your favorite parking lot?You can lay such fears to rest by investing in a garage door installed to your house. This garage door will be a reliable, sturdy shield against any threat, whether imagined or real. Both residential and commercial car owners have chosen to install garage doors in order to give them peace of mind that their car won’t be broken into, vandalized, or worse, dismantled. Installing a garage door is the best way to protect not just cars, but other vehicles such as SUVs, trucks, and even motorcycles. Ken Davidson Garage Doors helps you choose and install the best garage door for your house. Installation, however, is the easy part. What is more challenging is the maintenance of your garage door. Just because it’s a reliable, sturdy shield doesn’t mean that it’s impervious to functional defects. Even the highest-quality garage doors can develop problems over time. There are garage doors that develop squeaky or grating noises. There are also garage doors that operate slower or faster than usual. But the worst-case scenario is a garage door that stops operating completely- it won’t budge no matter how much it’s cleaned or oiled. While you can always research on do-it-yourself quick fixes over the Internet, you should put your garage door under the care of experts in order to ensure that you don’t accidentally damage it further. Ken Davidson Garage Doors is eager to implement garage door repair on your behalf. You can rely on us to complete your garage door spring replacement. We have a professional team trained in all aspects of garage door spring repair. When you call Ken Davidson Garage Doors, we dispatch one of our skilled technicians to your home to perform your garage spring repair. Our technician arrives in a fully stocked truck, which means we have the parts and tools on hand to repair your garage door spring. We know that malfunctioning garage door is an inconvenience, and also a safety hazard, so aim to repair or replace garage springs as efficiently as possible. cost-effective to perform garage door spring repair for all springs rather than one at a time. If you need garage spring repair, contact us at Ken Davidson Garage Doors. Our experts can advise you on the right replacement springs for your garage door. Repair costs may vary based on the type, size, and quality of garage spring you need. We can advise you on garage door spring repair parts and options and complete your replacement services efficiently. delivering top-quality professional service and back up all our work with a guarantee. Many homeowners never think much about their garage doors, unless there is a problem. However, garage doors are complicated mechanical moving parts, which feature springs under high tension to operate. In addition, many modern garage door openers are electric-powered. When a garage door suddenly stops functioning, the door can get stuck and trap your vehicle inside. Broken doors can create serious hazards to your property or your loved ones. Homeowners should treat garage door issues as a major home emergency and never take on problem diagnostics or repairs themselves. The best way to prevent sudden, disruptive garage door malfunctions is to have your door inspected on a regular basis. Homeowners in northern New Jersey can turn to Ken Davidson Garage Doors for a no-cost garage door inspection. We offer this valuable service to our customer free of charge, because we want to keep your family safe and prevent unavoidable damage to your home. When you contact Ken Davidson Garage Doors for a garage door inspection, we send one of our skilled technicians to your home as soon as we can. Our experts know all about garage doors and garage door openers and can spot problem areas that require attention. We follow a 25-point safety checklist to make sure we examine your door completely and provide you accurate, immediate feedback. door repairs. At Ken Davidson Garage Doors, we can handle necessary garage door service from minor hardware upgrades, to garage door opener repairs, to complete door replacements. Our 40+ years of exclusive focus in garage door makes us the #1 choice for San Dimas homeowners who need garage door service.